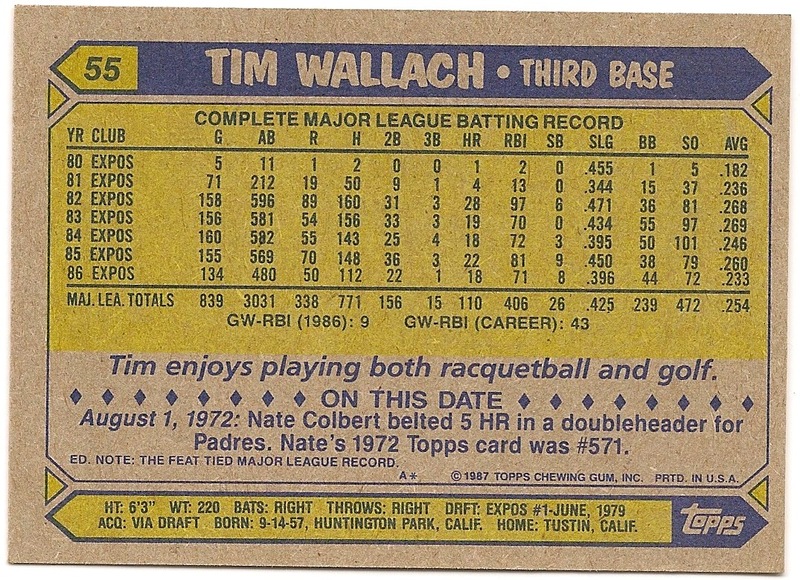 Card Review: 9.9 This is on the short list for my all-time favorite Tim Wallach card. Ultimately, I don't think it walks away with that title, but it's certainly top 5, if not top 3. 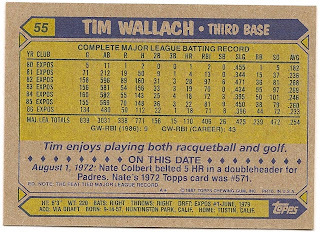 1987 Topps wasn't the first set I actively collected, but it's the first year I remember the majority of my friends collecting. 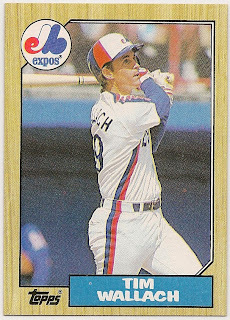 For the few years prior to '87, my trading expierences consisted of getting ripped off by the older kids in the neighborhood, by trading away super stars for Wallach's and anyone else in an Expos uniform. 1987 was my first chance to get ripped off by kids my own age. That's a bit of a stretch I guess, because even back then I was already gaining a bit of a reputation as a stat and trivia savant, at least amongst my peers. So the Yount for Wallach trades weren't being made out of ignorance, I just would rather of had the Wallach. In any event, I'm of the age that I consider 1987 Topps one of the all-time great sets. I have nothing bad to say about this card. If forced to, I'll offer this, the "On This Date" blurb on the back should be tied into the Expos or Wallach.